Study Tours. Travelling to learn! One of the main objectives of the School of Tourism and Hospitality Management Sant Ignasi is to promote the internationalization of the center, contribute to the training of their students in developing skills in academic environments, and promoting mobility and professional experience in diverse cultural contexts. During the second semester of the third year of the degree, students have the opportunity to pursue an academic semester in one of the foreign universities from HTSI´s international network of partners, to enroll on optional subjects related to tourism and hospitality management. The university makes this possible through the European ERASMUS (Erasmus Charter for Higher Education) program and through bilateral agreements maintained by the School of Tourism and Hospitality Management Sant Ignasi with various American and Asian universities. Spend a period abroad in a partner university. Gather further knowledge by validating courses and credits. Learning to be more flexible and adapt to new situations. Students who choose an academic period abroad have the advice and support of both the School of Tourism and Hospitality Management Sant Ignasi and the host university at all times, in helping with the choice of subjects to study, documentation, visas, and accommodation. HTSI has a significant global network of partner universities that allows for university exchange programs aimed at training students and exchanging professors and research on the highest level. Together with these universities, we organize training programs and programs for exchanging students, professors, and administrative and services staff, summer schools, study tours, joint research programs and conferences and seminars. We enjoy partnerships with universities with global prestige located in Europe, America and Asia. Studying tourism and hospitality management means travelling to learn. The School of Tourism and Hospitality Management Sant Ignasi promotes student mobility as a part of its program for training tourism and hospitality professionals. There are a number of skills that are essential to students of the Bachelor Degree in Tourism and Hospitality Management, such as mastery of foreign languages, intercultural compatibility and international experience. Through these trips, students get a change to enjoy enriching experiences together with classmates from the HTSI community. These experiences improve students’ understanding of themselves with activities out in the real world, and help them discover the reality of the tourism and hospitality sector beyond purely academic aspects. 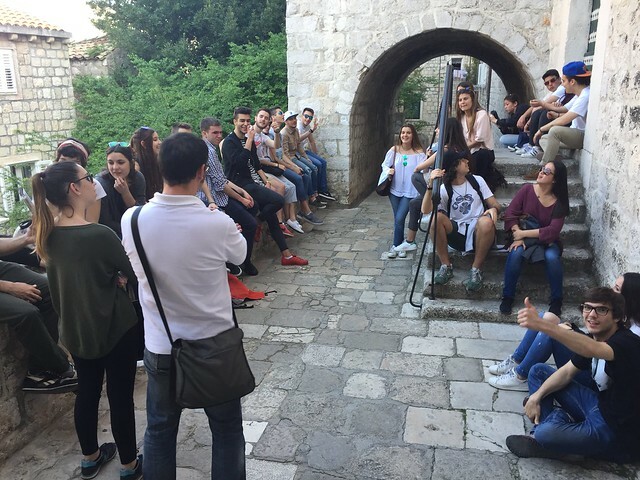 Dubrovnik: students got a look at tourism development on the coast of Croatia, took part in multiple tourist routes (including one based on Game of Thrones), and visited a number of hotel establishments. San Francisco: students took classes at the University of San Francisco, participated in the Annual University of San Francisco Hospitality Industry Symposium and visited tech start-ups connected to the tourism sector. Senegal:this trip had a social focus, and presented HTSI students with the reality of life in Senegal. Morocco: in collaboration with the Pare Tarrés School of Education and Social Work and the Blanquerna School of Health Sciences, this trip sought to put students in touch with the reality of healthcare in Morocco. Philippines: this trip had a social focus, and allowed students to discover the status of tourist development in the country. Hong Kong: in collaboration with Hong Kong Polytechnic University, students attended academic sessions at the School of Hotel and Tourism Management and visited a number of hotel and tourism businesses in Hong Kong. If you are already a bachelor student at one of our partner universities and you would like the experience of studying in Barcelona, you can study at HTSI for one or two semesters as an exchange student. Students of any of our partner universities are eligible to study at HTSI. The application and selection process for exchange programs is always run by students’ universities of origin. As a result, all future students must apply for the exchange program through their university’s International Office. Each semester, HTSI welcomes a number of international exchange students from our partner universities around the world. Their presence on campus and their contribution to our academic and social life help to promote the internationalization of our School. The Free Mover Program allows bachelor students to complete part of their studies in Barcelona and to take official bachelor studies at the School of Tourism and Hospitality Management Sant Ignasi – Ramon Llull University for one semester (a maximum of 30 ECTS credits per semester) or a full academic year (a maximum of 60 ECTS credits). All Free Mover candidates must have completed one year of university studies at their school of origin, and must comply with current Spanish legislation regarding visas, insurance and other legal requirements. Students participating in the program do not need to request that their academic records to be transferred. HTSI will not provide students with a final title at the end of their stay; rather, we will provide them with an Academic Certificate showing the different courses they studied and the marks they obtained in each.